The validate package is our attempt to make checking data against domain knowledge as easy as possible. Here is an example. The summary gives an overview of the number of items checked. 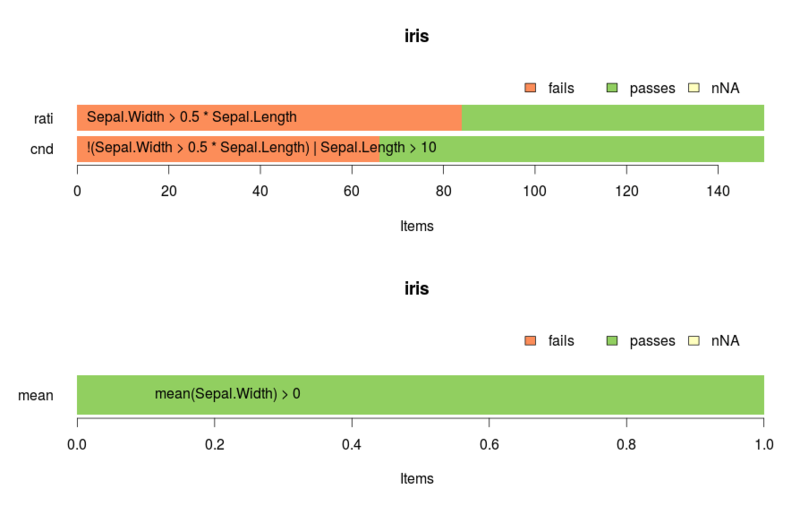 For an aggregated test, such as the one where we test the mean of a variable only one item is tested: the whole Sepal.Width column. The other rules are tested on each record in iris. Furthermore the number of items that pass, fail or could not be evaluated because of missingness are reported. In validate, data validation rules are considered objects of computation that may be stored, read, manipulated and investigated. The validator object supports such activities so validation rules can be reused. We can confront the iris data set with this validator. The results are stored in a validation object. These are just the basics of what can be done with this package. To leave a comment for the author, please follow the link and comment on their blog: R – Mark van der Loo.